FGH stands for Freemans Grattan Holdings. This week it becomes a new keyphrase as Otto UK rebrands. Otto is a huge retailer in Europe but the name always punched below its brand recognition weight in the UK. FGH is an improvement simply because more UK customers will recognise 'Freemans' and 'Grattan'. FGH is also a viable keyphrase. The FGHe rebranding hasn't been done with any SEO thought and Otto are yet to claim their search space. It's the newspapers who rank for [FGH] terms. 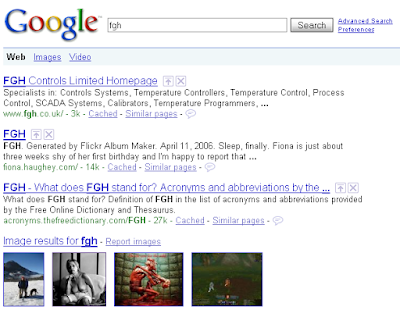 An other issue with the new FGH may be with Google and saggy breasts. Otto sites do not yet rank. Pictures of saggy breasts do. Google does have a "report images" link for cases like this but I sense a whole art/p0rn debate coming on. However, the keyphrase may well be short lived as Otto has something even more important than their search space to worry about - the entire home shopping business has started a 90 days consultation of its entire 3,800 work force. The goal? To dramatically downsize the business. We are running at significant losses. To shut down the company would be the cheapest solution, but we are categorically not shutting down the business. I firmly believe in the UK market. The UK is the fourth largest [home shopping] market in the world and Otto Group [FGH's parent company] is the number one home shopping company in the world. I suspect many causal readers from the UK will be surprised to hear the company described as the number one shopping company in the world. That just goes to show the turn around Otto needs to pull with not only their finances but their brand too.